VIRGIL VAN DIJK believes Liverpool team-mate Alisson is already making his presence known after the star goalkeeper’s Premier League debut last week. 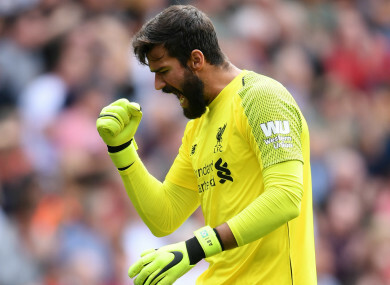 The world’s most expensive goalkeeper at £65million from Roma before Chelsea signed Kepa Arrizabalaga for £71m, Alisson made his bow as Liverpool crushed West Ham 4-0 on Sunday. Alisson had little to do in Liverpool’s demolition of the Hammers at Anfield but Reds centre-back Van Dijk said the Brazil international is making a difference to Jurgen Klopp’s side. When asked about Alisson and how he is settling in, Van Dijk said: “Very good. “We speak a lot. He’s very vocal and that helps. It helps me and everyone in the back line. I think his presence is very good as well. Van Dijk also praised defensive partner and England Under-21 international Joe Gomez. Gomez lined up alongside Netherlands international Van Dijk in the absence of Dejan Lovren, Joel Matip and Ragnar Klavan against West Ham. “I was not really worried to be fair,” Van Dijk added. “I’ve played a couple of games pre-season with Joe at centre back and I have a very good relationship with him, a very good understanding outside of the pitch as well. That helps and hopefully we can build something. Email “'He's very vocal. That helps me and everyone in the back line' - Van Dijk praises Alisson impact”. Feedback on “'He's very vocal. That helps me and everyone in the back line' - Van Dijk praises Alisson impact”.